Definition of a weed: any undesirable or troublesome plant, especially one that grows profusely where it is not wanted. Most people would think that Himalayan Blackberry would fit into this category. And usually they would be right. It grows all over Western Washington, forming dense, impenetrable thickets, with canes that reach 10-20 feet long. It was these long canes I was considering as I pondered my new raised vegetable beds. I needed a support for my peas, for my beans, for the cucumbers and maybe even tomatoes. We had recently moved and there were plenty of blackberries to choose from. They were long and flexible, eagerly reaching into trees and shrubs all over the yard. 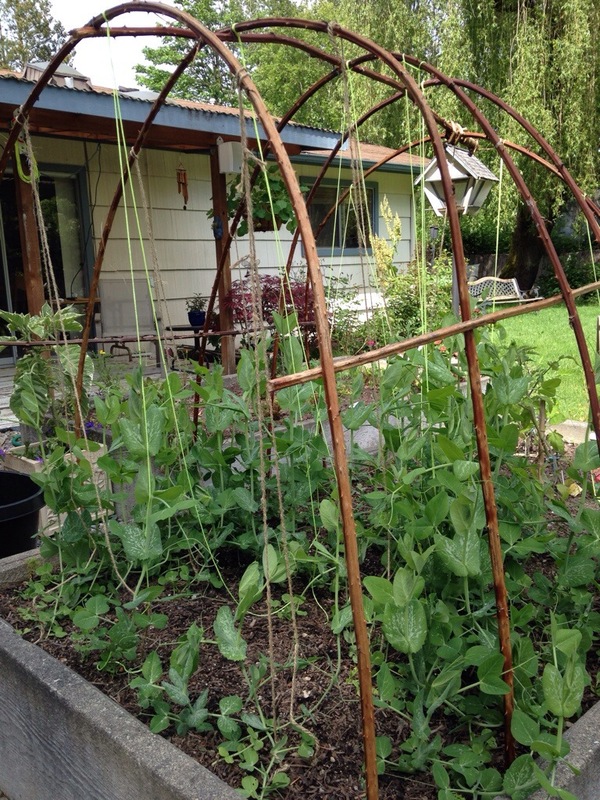 As we hacked at them, I decided to put them to use and build a trellis for my veggie beds. I used a soil corer to create a hole about 10 inches deep, into which I pushed the canes. The canes were wedged between the concrete of the beds and the soil and have been quite stable. We reinforced with a few cross pieces and hung some string for the plants to climb. As the canes aged they turned brown and hard, providing a good support. I left the thorns on thinking they could provide more surface area for the climbers. I plan on planting my cucumbers soon to replace the peas when they finished. Let’s make those weeds work for us! What else can we build out of blackberry canes? Great idea! Do they get soft as the season goes on?